Here is the promised rule set. The basic structure of Move-Fire-Melee is unchanged from the early Featherstone set from which they are developed. However, the rules have been extensively altered in the movement, melee and firing sections, but I think I can claim they are no more complex than the originals. The morale section is probably the least altered. A basic organisational and command system has been tacked on. The rules deal with Austrians and Prussians only. My own 'normal' units have 5 bases for line infantry, 4 bases for light infantry and cavalry, and artillery usually used as single bases, but occasionally 2 or 3 bases strong. All dice are D6 unless specified. Of course, any comments (good or bad) are encouraged, and all questions will be answered. Should anybody actually fight a game with these rules, I demand to know the results! These rules are designed for 25-30mm miniatures, mounted together on bases. Base sizes I use are roughly 40mm x 40mm for line and light infantry, 50mm x 50mm for cavalry and 60mm wide x deep enough for your guns for artillery. A base has 4 line infantry, 2 light infantry or 2 cavalry figures. Artillery bases have one gun model with crew figures, and represent ‘positional’ artillery of the 6-12pdr class. A battalion of infantry or a regiment of cavalry should have between 4 and 6 bases. Artillery batteries should have between 1 and 4 bases. Standard formations for infantry and cavalry are line (all stands next to each other) or march column (all stands one behind the other). An ‘L’, ‘U’ or square shaped line may be formed to counter flank and rear threats, and an irregular line may adopted to conform with terrain features. Other formations are only allowed when necessary due to terrain restrictions. Light infantry may adopt any formation provided all bases touch each other. Any infantry or cavalry unit reduced by fighting to a single base is removed. Battalions, regiments and batteries are the basic game units. They should be organised into brigades of 2 to 6 units. Cavalry and infantry cannot be mixed within brigades. Each brigade will have a brigade commander. Units of the brigade must normally stay within 8 inches of their commander. Any unit outside this distance may only move if it rolls a 4,5 or 6. Light infantry battalions, light cavalry regiments and artillery batteries can act as independent units which need not be part of a brigade formation (but can be if desired). Prussian - 1, deficient; 2,3,4, dependable; 5,6, distinguished. Austrian – 1,2, deficient; 3,4,5, dependable; 6, distinguished. Deficient commanders have a 4 inch command distance, and must dice at the start of each move. If a 1 is thrown they suffer a loss of nerve that move and their brigade halts. Only units with friendly units belonging to the same brigade between them and the enemy may move forward. Movement away from the enemy is allowed. Dependable commanders act as normal at all times. Distinguished commanders have a command distance of 12 inches, and must dice at the start of each move. If a 6 is thrown the commander shows tactical brilliance that move and all units in the brigade receive an additional 3 inch move bonus. This is a ‘free’ bonus that does not affect firing and can be added to any move. The Commanding General represents the player and is not rated. He can influence the game through helping the morale of units to which he attaches himself, and by encouraging his brigade commanders. The Commanding General may always move first. If he moves into contact with a brigade commander, a deficient officer becomes dependable, a dependable officer becomes distinguished, and a distinguished officer shows tactical brilliance on a throw of 5 or 6. The effect ceases when the Commanding General moves away. There is no system of orders. 1. Charges 2. Move 3. Fire + Morale 4. Melee + Morale 5. Rally throws. Charges take place when one or more units are brought into direct contact with an enemy unit or units using normal movement. As long as at least half the attacking unit is within move distance, the whole unit may move into contact. The attacker can then declare that he has forced a melee. Infantry of any kind may not charge cavalry; light infantry may only charge other light infantry. Light infantry and light cavalry may move out of turn to evade contact; light infantry may fire out of turn as they do so. Units from a brigade led by a deficient commander may be prevented from charging – they do not charge if 1 or 2 is thrown. Units from a brigade led by a distinguished commander, and all Prussian cavalry, may counter-charge on a throw of 3, 4, 5 or 6 (subject to the above exceptions); other units may counter charge on a 5 or 6. Flank or rear attacks. A unit may be attacked in flank if at least part of the attacking unit is behind its front at the start of the attacking move. If the entire attacking unit is behind the front of the defender, the unit may be attacked in rear. If a unit is able to be attacked in flank or rear, the force being attacked must throw one dice and act in accordance with the appropriate part of the Morale section. Units able to ‘fight as normal’ may then counter-charge, subject to the usual throws. A unit that has adopted an ‘L’ or ‘U’ shaped formation may choose whether to make the morale throw or not. Units in square do not need to throw. Firing in the charge phase by attackers. When a unit is charging, adjacent friendly units (within the limits of their range) can fire during the charge phase on the enemy being attacked, thus giving covering fire. The chargers themselves may also fire on the defenders. Throw a dice to decide the range as below, if necessary. If the defenders are reduced to half strength they have to throw for pre-contact morale. Firing in the charge phase by defenders. Attacked troops who can fire will always do so, and chargers moving in to attack must take fire from all units whose line of fire they cross. If their numbers are reduced to half they must throw for pre-contact morale. The troops under attack and their supporting units may have to decide at what range they may fire on their attackers. To do this they throw a dice - for example, if the choice is between short and medium range, a throw of 1, 2 or 3 would mean medium range, 4, 5 or 6 short range. Add one to throw for guards or grenadiers, deduct 1 from throw for ‘poor’ units. If a unit being attacked evades, falls back or routs, the attacking unit may continue to advance up to the limit of its move, if it wishes. If this results in contact with further enemy units, fight the new melee as normal. Players dice first to determine order of movement – the winner decides whether to move first or second. Mark units that have not moved. 1. Only light infantry can move through woods, up steep hills, through marshland, through and around houses etc., at their normal rate as given above. All other arms move at half normal rate on these occasions. 2. Artillery takes half a move to limber or unlimber. They may only unlimber and fire if they do not move as well. Unlimbered artillery cannot move, but may pivot in place, in which case it cannot fire. 3. Fences, walls etc that are deemed climbable take half a move to cross. These obstacles are impassable to artillery or transport. 4. Formation changes take half a line move for Prussian infantry or cavalry (unless ‘poor’ quality). Move the leading stand the reduced distance, then the remaining stands are moved into the new formation regardless of distance. All other units take a full move to change formation. Light infantry, and routing units, do not deduct to change formation. 5. Units cannot move if in an ‘L’, ‘U’ or square shaped formation. They must reform into line or column before moving. 6. Cavalry mounting or dismounting takes half a move. Replace each cavalry base with a dismounted base. Dismounted cavalry fight as light infantry. 7. Troops voluntarily passing through friendly units move at half rate. 8. Infantry and cavalry can move backwards at half normal rate. Infantry, cavalry and limbered artillery may make an incline move at up to 45º at half normal rate. Light infantry and light cavalry can use normal rate in both situations. 9. A march column is a maximum of 1 base wide. Any other formation counts as line. All hits are subject to saving throws; hits not saved count as casualties. Record all casualties inflicted on a unit and remove a base for every 4 casualties. It takes 4 casualties to remove any base, regardless of type or how many model figures are on the base. Casualties are cumulative from one move to the next. Units that have fired in the charge phase cannot fire again in the fire phase. Attached officers. If a brigade commander or Commanding General is attached to a unit that suffers casualties, one dice is thrown and a 6 means the officer is lost, with no saving throw. At 12 inches to 6 inches – deduct 3 and the remainder are hits. Under 6 inches – deduct 2 and the remainder are hits. Odd numbers. A unit may have 1, 2 or 3 casualties noted against it. A full dice is thrown per base on the table regardless of how many casualties the unit has taken. Light troops with rifles have a range of 18 inches – at 9 to 18 inches they deduct 3 from the dice, at under 9 inches deduct 2. Cavalry carbines have a range of 8 inches – at 4 to 8 inches they deduct 3 from the dice, at under 4 inches they deduct 2. Cavalry only fire dismounted. Deployment for firing. Infantry may fire 45º left or right of the direction they are facing. Troops situated on higher ground may fire over the heads of friendly troops provided the target is no closer than 6 inches to the friendly unit. Ammunition. Each gun has 10 rounds per battle (coloured plastic counters or dice being used). It may fire one successful round per move. If the gun misses with its first shot it may have one more shot that move if desired. When a gun runs out of ammunition it may no longer fire unless ammunition is brought across from another gun under normal move conditions (a limber may be used for this). Firing Artillery. When a gun is fired, the target is nominated and a dice is thrown. If the target is over 4 feet away from the gun then a hit is registered by a throw of 6. When a hit is registered, the player throws 1 AVERAGE DICE and the total is the number of hits the gun has caused. Deduct one from the dice for every casualty currently recorded on the artillery base, or if firing counter battery. Position of artillery when firing. Artillery has unlimited range on the wargames table, being only restricted in its targets by natural obstacles such as hills or houses etc. Guns can fire over their own troops if the gun is sited on a higher level such as a hilltop and the enemy are not closer than 6 inches. Dead ground behind woods or houses when firing from a hill is 12 inches. Unless the gun is on high ground, the target must be that enemy force its fire would first encounter. Guns may fire 45º left or right of the direction they are facing. Throw one dice for each hit on infantry or cavalry units or on limbered artillery bases. All dice that fall 5 or 6 count as saved hits. Firing hits (not melee hits) on light infantry and unlimbered artillery are saved on a 4, 5, or 6. Units under cover add one to their saving throw. 1. One round of fighting takes place per move. 2. One AVERAGE DICE is thrown for every base of the units involved (including bases not in contact with the enemy), except for bases facing to the flank or rear, or bases not in the first rank. Units with casualties still count every base as a full dice, as with firing. 3. Guards or grenadier infantry or cuirassiers always add one dice to the number thrown. Cavalry fighting infantry or artillery always add one dice. Units classed as ‘poor’, light cavalry and light infantry deduct one dice, unless light infantry are fighting in houses, woods or marshes. Guns deduct one dice, but always throw a minimum of 1 dice. 4. Count half the total dice score as hits, rounding down. A base is removed for every four casualties caused after saving throws. 5. Casualties having been determined and removed, both forces now have to check their morale – see Morale section. Should both sides’ morale rating enable them to stay in their present positions, a further round of fighting will take place at the conclusion of the next move; this carries on until one or both units withdraw or are destroyed. (a) Troops charging uphill, or at defences such as walls, fences, houses etc., or charging across a river ford do not get impetus bonus. (b) Troops charging downhill get double impetus bonus (2 dice). (c) If a unit is counter-charged, neither side gets an impetus bonus. Attached officers. If a brigade commander or Commanding General is attached to a unit in melee, throw one dice at the end of each turn of melee. A 6 means the officer is lost, with no saving throw. Overwhelming numbers. If a force is outnumbered 2 to 1 by similar troops or by cavalry, or 3 to 1 light troops against line or infantry against cavalry, then the weaker force must immediately throw for morale as per appropriate section in Morale. Reinforcing a melee. If force A moves first and attacks force B, then it is quite fair for force B to move reinforcing troops from adjacent positions into the melee – these troops will get impetus bonus if applicable. Troops reinforcing a melee that has already been going on for one or more moves do not get impetus bonus. Troops retreating voluntarily from a melee. Such troops must throw a dice: 1, 2 or 3 they are routed, 4, 5 or 6 they fall back. If cavalry fighting infantry, add one to dice. Guns in melees. If a gun is overrun (has to fall back or rout), then a dice is thrown and 4, 5 or 6 means the retreating troops have managed to get their gun away. It can limber up if unlimbered and move away the rest of its move. 1, 2 or 3 means that the gun has been lost. Throw one dice for each hit. All dice that fall 5 or 6 count as saved hits. 1. Pre contact morale. If a unit is reduced to 50% by firing, if a unit on its immediate flank routs (within 6 inches), or if a friendly unit is forced by morale to rout through it, then that unit must roll a dice for morale. A score of 5 or 6 means they fight on; 3 or 4 means fall back half a move in good order facing the enemy; 1 or 2 means rout a full move and end up facing away from the enemy. 2. Following a melee. On conclusion of one turn of melee fighting both units involved throw a die. If one side outnumbers the other by at least one full base, it adds one to its score. Results are as per pre contact morale. If the overwhelming numbers rule is being used, only the outnumbered force throws for morale. For results see separate section below. 3. Commanding General or Brigade commander killed. If Commanding General, all friendly units within 12 inches check morale as above. If brigade commander, all units in the brigade check. Brigade continues as if with a deficient commander. 4. Subsequent actions of units affected. When a unit falls back this counts as its movement in the next turn. Apart from this it may continue as normal. When a unit routs this also counts as its movement in the next turn, but an attempt must be made to rally the unit at the end of that turn. A 4, 5 or 6 means the unit has rallied, and it may turn and face the enemy. If a 1, 2 or 3 is thrown the unit continues to rout. A unit which continues to rout may only then be rallied in subsequent moves if a brigade commander or the Commanding General moves into contact. The unit must now roll 5 or 6 to rally. If this fails the unit cannot be rallied and retreats off the table. If, during the course of its retreat, any routing unit reaches the edge of the playing area then it must be removed from the game. Units falling back halt at the table edge. If a brigade commander or the Commanding General succeeds in rallying a routing unit, the officer must stay with the unit for the rest of the battle. 5. Overwhelming numbers. Smaller unit throws one dice: 5 or 6 means fight as normal; 3 or 4 means surrender if no friendly unit within 6 inches, otherwise fall back; 1 or 2 means rout. 6. Flank or rear attacks. Before melee, throw one dice. 5 or 6 means turn and fight as normal (including counter-charging and firing at attackers), 3 or 4 turn and fight with half eligible bases (rounded down), 1 or 2 rout. Deduct one from dice if attacked in rear. Units already routing that are attacked in flank or rear are destroyed. 7. Surrender. Units are removed and count as destroyed. Units accepting a surrender cannot move next turn. Routing units which contact an enemy unit surrender. In cases of surrender, attached officers are lost on a throw of 6 as normal. 8. Units in cover, with a brigade commander attached or grenadier, guards and cuirassier units add one to any morale dice. Units with Commanding General attached add 2 to their throw. Units classed as ‘poor’ always deduct one from their morale dice. 9. Artillery does not check morale. 10. Never dice more than once per move for morale, except when a check for reaction to a flank or rear attack has been made and the unit fights on. Large houses can hold 3 bases of troops, small houses 2 bases. Bases may be placed behind the house or left off table. Troops concealed in houses count as being under cover. They are meleed as normal using the cover saving throw. At the commencement of the game a dice is thrown to find out from which direction the wind is blowing – 1, north; 2, east; 3, north-west; 4, west; 5, south-east; 6, south. When a house is hit by artillery fire, a dice is thrown to see if the house has caught fire. If a 1 or 2 is thrown it is on fire and must be evacuated by its occupants that move unless they wish to perish within it. In the case of a village the next house in the direction of the wind within 6 inches may catch fire on the next move - use the same throw. In an encounter battle, units may deploy up to 12 inches from their baseline. The players each throw a dice and the higher scorer decides whether to deploy first or second. The first player then deploys one brigade or independent unit. The second player does the same and deployment then continues alternately. Record the number of units on each side – half this total (rounded down) is the army’s breaking point (see Army Morale). Deployment for other scenarios will be tailored to each individual set up. Add up the number of units in each army – half this total (rounded down) is the army’s breaking point. At the end of each move, each unit destroyed, removed from play or routing counts as one unit lost; each unit at half strength or lower but still in good morale or only falling back counts as half a unit lost. The first army to reach its breaking point loses the game. If both sides reach their breaking point in the same move, the game is drawn. If the game has to end before either side reaches its breaking point, an army which has lost at least 2 more units than its opponent is the loser. If this is not the case, the game is drawn. Like any set of rules these will change over time. I intend to include these changes as they occur by editing the rules post, and then flagging up the changes in this section. 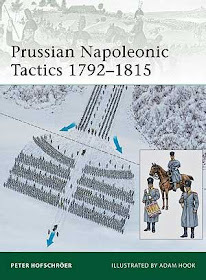 Change number one - as a result of reading Brent Nosworthy's Anatomy of Victory, movement, note 4, has been changed to give a greater distinction between Prussian and Austrian drill, and to include Prussian cavalry in that distinction. Change number two - third paragraph of Melee section amended, again giving slightly more advantage to the Prussians as a result of reading Nosworthy and Duffy. Change number three - Melee process, point 2, amended. Change number 4 - morale section: distance within which a routing unit affects other units to its flank increased to 6". Change number 5 - created additional first sequence in the move to cater for charges, and moved all the appropriate bits of the rules to that section. This makes playing the move easier to understand. Change number 6 - removed the 12"-18" range for musket fire. Reduced rifle and carbine ranges in proportion. So, the blog has now passed the 2000 visits mark. Just a short post to say thanks to any and all who have visited, and an especial thanks if you have taken the trouble to post a comment. Posts in the pipeline are another Benghazi Handicap AAR (probably 'Rally Forward'), a Polish scenario and maybe a set of 18th Century rules (simple) developed from the Featherstonian set already posted. I know, just what the wargaming world needs, another set of rules. Well, it keeps me happy! A few photos just to make the post a bit more worthwhile. Thanks again everyone. Swiss pikemen of the Italian Wars (15mm). This unit was part of the army sold to finance my SYW collection. Gone but not forgotten! French heavy cavalry of the Italian Wars.